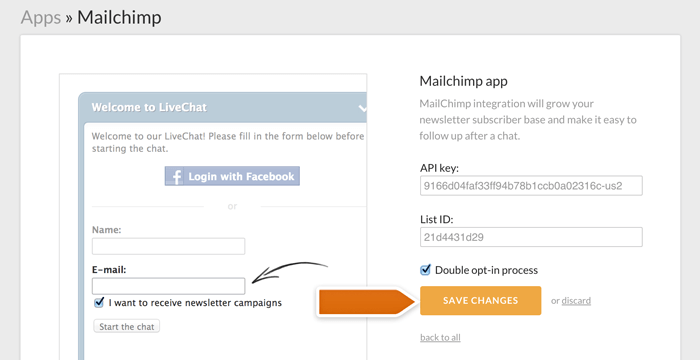 You can expand your newsletter subscribers list using our MailChimp integration. 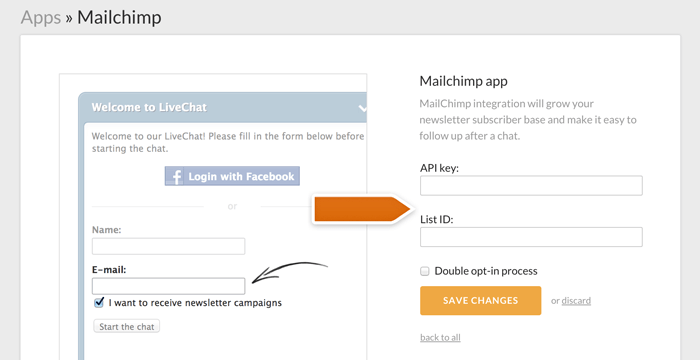 It will allow your visitors to signup for your newsletters when filling out the pre-chat survey. 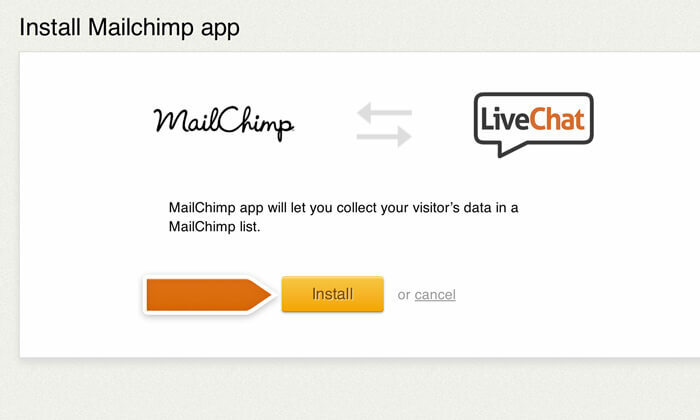 Go to the MailChimp integration page and click on Install application. Click on Install to proceed further. You will be redirected to the integration page where you need to fill in the Mailchimp’s List ID and Mailchimp’s API Key fields. To get the List ID, go to Audience section in MailChimp, find the desired audience, click on Settings → Audience names and defaults, and copy the code under the Audience ID. Next, you need to access your account Profile. 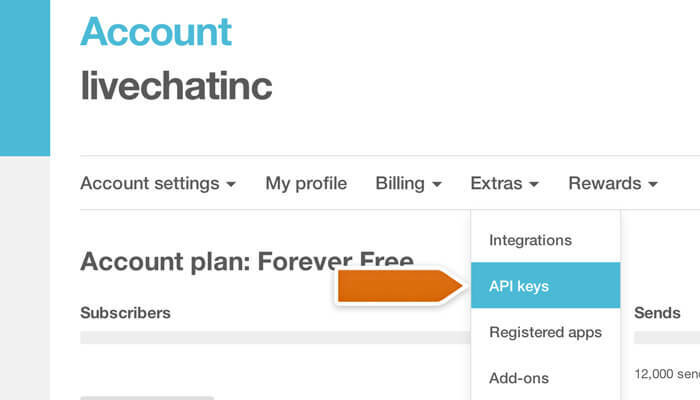 You can get your API Key by accessing the Extras and proceeding to the API Keys section. 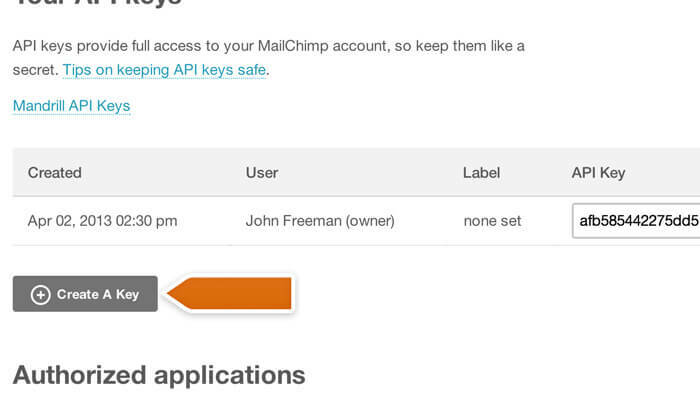 You can either use an existing API key or choose to issue a new one by clicking on Create A Key. Save integration setting by pressing Save changes. Next, you need to add an E-mail with confirmation field in the pre-chat survey section. Finalize by selecting Save changes. From now on, your visitors will be able to subscribe to your newsletter every time they fill in the pre-chat survey, gaining you a lot of new contacts and newsletter subscribers. The double opt-in process requires users to opt-in to your mailing lists twice. First, they need to enter their email address into the sign-up form. In the next step, they receive an email with a confirmation link. It means that subscribers won’t receive any emails from you unless they confirm that they really want to join your list. Use the double opt-in option if you want to keep the quality of your lists high. First of, such lists have higher engagement and response levels. By targeting people who confirmed interest in your emails, you get more opens and more clicks. Moreover, since you send a confirmation email, you also ensure the email used by the subscriber is valid. There’s no option for any person to provide a fake email address or one that doesn’t belong to them. It also helps to keep spammers and spambots off your healthy lists. All that results in lower bounce rates and unsubscribes and fewer spam complaints. The double opt-in is ultimately a choice between the size and quality of your list. The question you need to answer is whether you focus on quantity and quick results or quality subscribers who will open and click through your emails. 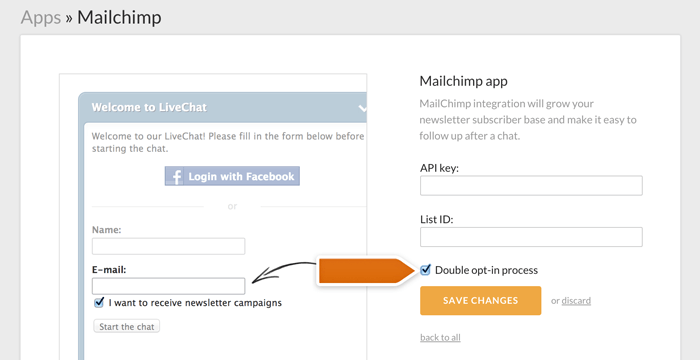 Check out the Mailchimp’s knowledge base to learn how you can customize your double-opt-in confirmation emails. 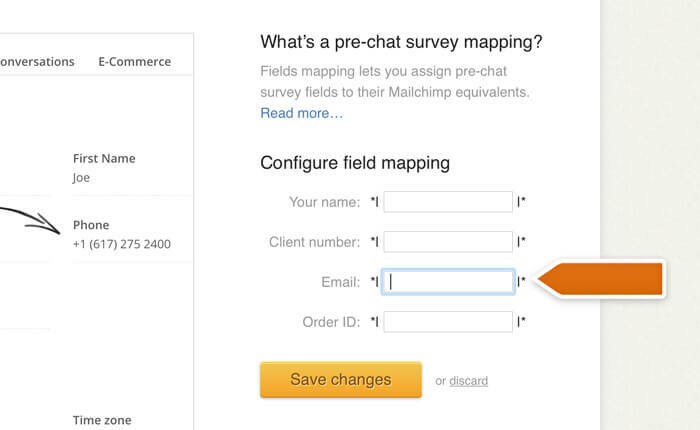 You can map pre-chat survey fields from LiveChat to their Mailchimp equivalents. 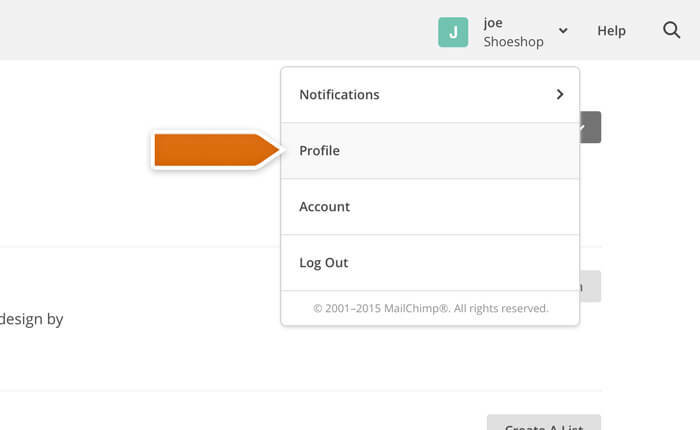 To do that, go to the Survey mapping section of the Mailchimp integration and select the field you want to change. For example, let’s choose the Email field. 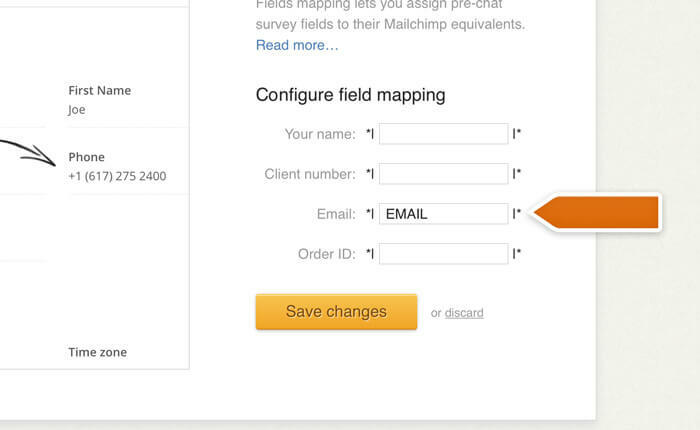 Next, type in the name of that field you use in Mailchimp. In our case, this will be EMAIL. 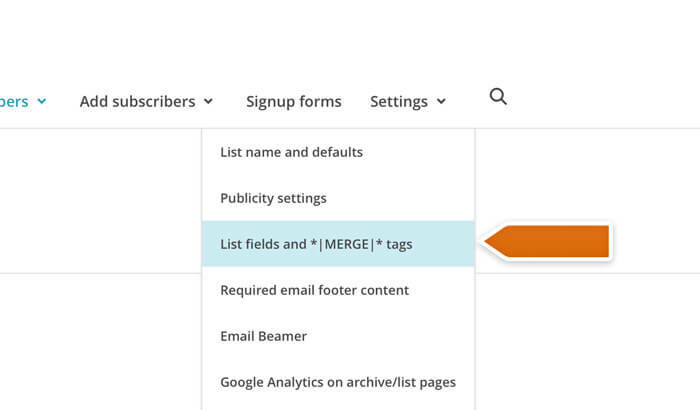 You can get the field names and *|MERGE|* tags for your list by accessing its settings and going to the List fields and *|MERGE|* tags section. 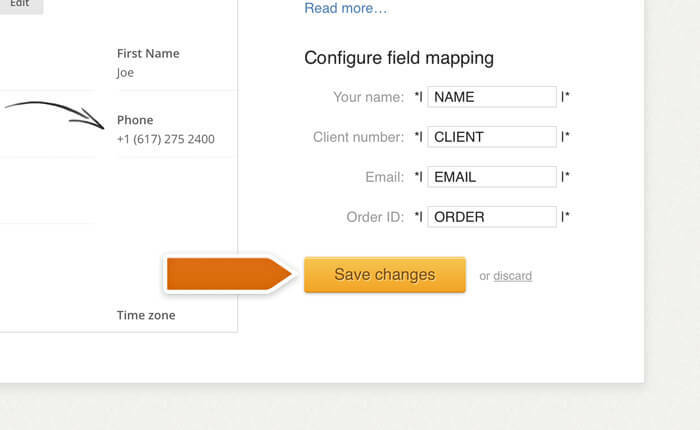 Simply copy the *|MERGE|* tag name for the field you want to map in LiveChat. 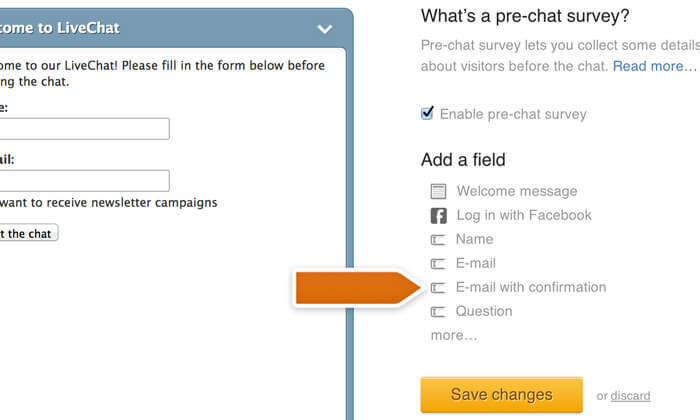 Once you are done setting up the fields for all your pre-chat survey questions, click on Save changes to finalize. From now on, the information from the pre-chat surveys will be stored on your Mailchimp account, along with other contact information.